One of the benefits of purchasing an iPhone is that you know there is always someone who can take a look at your device in-person at an Apple store. Samsung, or any other Android OEM at this time, does not currently offer that level of customer service, but the company is hoping to change that with an update to the Samsung+ app. Samsung has offered desktop support in the form of live chat and email, as well as phone support, but there has not been much face-to-face support, which many customers benefit from. Thanks to changes rolling out for the Samsung+ app, available on Google Play, Galaxy device owners in need of help will have access to one-on-one help from actual Samsung representatives. With the Samsung+ app version 3.0, users can quickly access a video chat option to troubleshoot issues, but not only that, you can grant access to the Samsung rep to control your device from their remote location. This is essentially TeamViewer, but for phones. Additionally, a Device Diagnostics feature will run tests to check the health of your phone’s battery, security, and data. 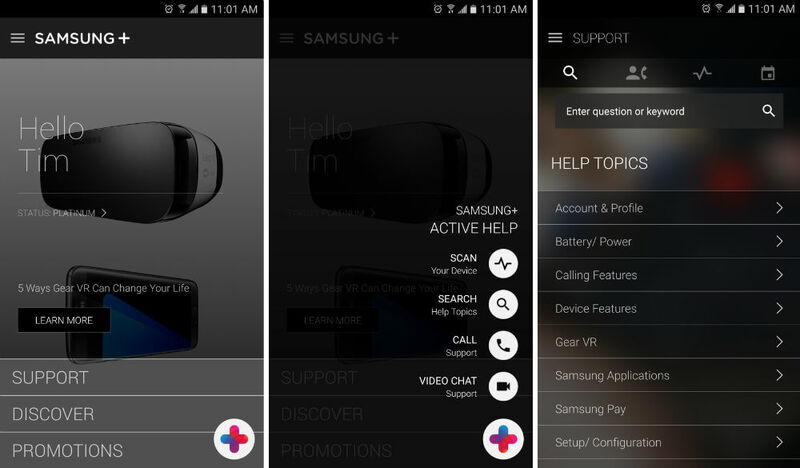 If asking Samsung for help is not your cup of tea, the app has a built-in FAQ of answers to many popular questions. If you think your problem is pretty basic, it is likely the answer is already placed inside of the app for you to find. Version 3.0 is rolling out right now to Google Play. If you own a Samsung device, you should have it installed.